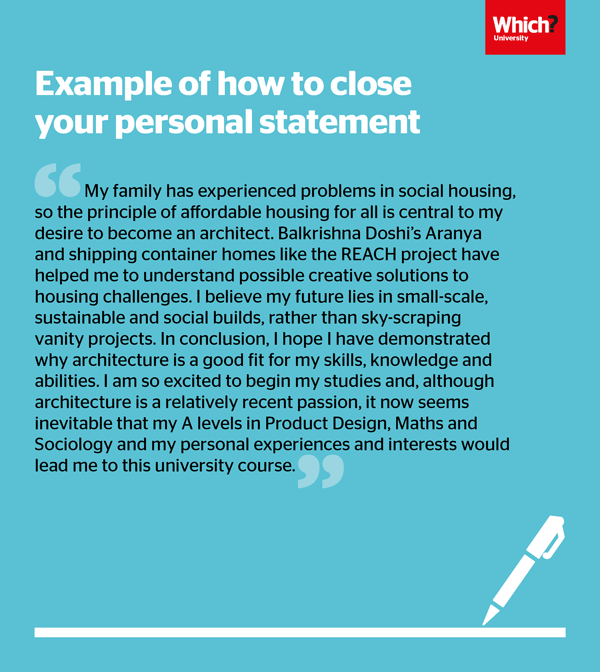 Your personal statement is one of the main things universities will look at when deciding whether to offer you a place. This is your chance to sell yourself and show them who you are beyond your grades. We know this can be tricky to do, especially since it's unlikely you'll have written something like this before. 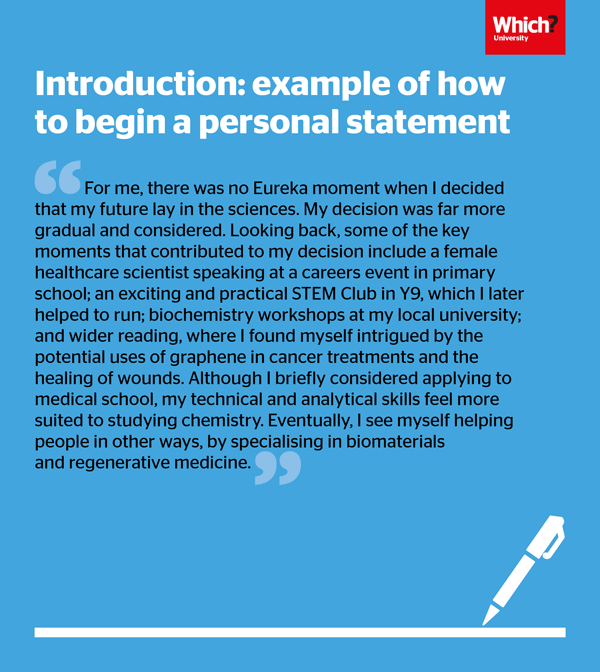 So we asked careers expert Cerys Evans to share some personal statement examples to illustrate the tone, language, structure and content you should be aiming for. But remember, these are just examples to guide you. Don't just copy and change the odd word. Universities take plagiarism seriously (and it's called a personal statement for a reason). an ending to your personal statement. Sometimes the hardest part is starting off! It can be difficult to know what to open with in your personal statement before getting to the meat of it. Use the example of the beginning of a personal statement as inspiration to get your mind whirring about how you can start yours. Read our full guide to creating a killer opening or how to get started if you're still staring at a blank Word doc. This should be at the heart of your personal statement. It's where you show your passion for the subject you want to study for three to four years, in depth. Make sure you spend some time on this section. It's a good idea to pull out similar threads from the different modules offered across all your Ucas course choices. Remember, you can find module or course information for different courses here on Which? University – simply search for a course here. 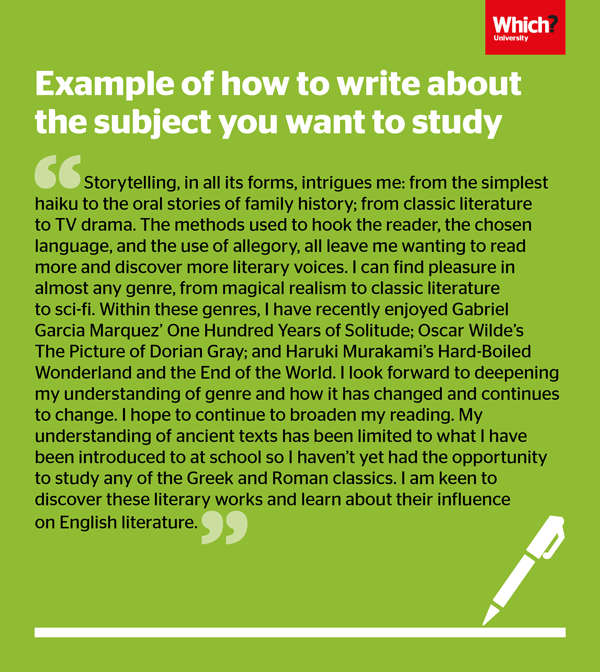 Doing this will ensure your statement is relevant to every course you're applying for, even if they vary a little. You can also read our degree subject guides, as well as our tips on tailoring your statement to different subjects. With so many courses to choose from, it might be difficult to limit your Ucas choices to just one subject. Alternatively, you may be applying for a combined or joint honours course. As above, make sure you look at common themes across the courses you’re applying for, or focus on the overall skills you need for all the subjects. 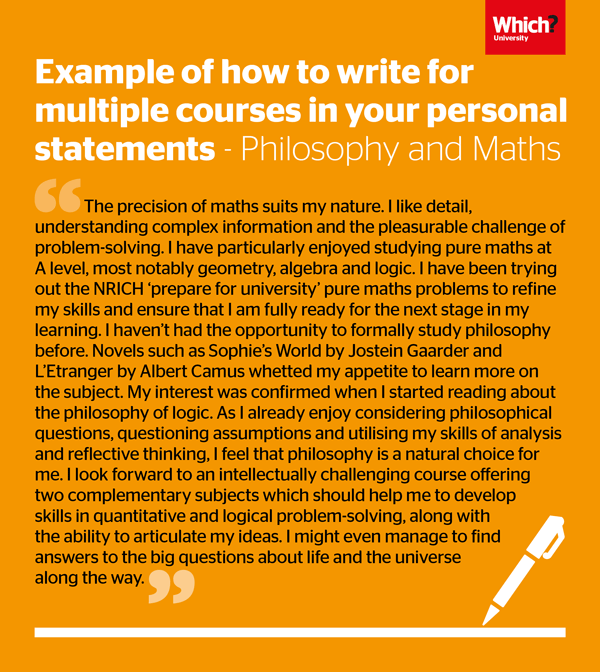 Read our full guide to writing a personal statement that works for multiple courses. It’s important to highlight any extracurricular activities you've gained over the past few years, whether it be hobbies or work experience, paid or unpaid. Pick out key skills, knowledge and lessons you’ve learned, and relate them back to your course choices and understanding of your subject. It’s time for the big finale, where you leave your lasting impression on the admissions tutor reading your statement. Haven’t started your personal statement yet? Pull together a simple draft to work from with our personal statement builder, including tailored questions and hints for your subject.